Sonomed Sp. z o.o. (Ltd.) was founded in Warsaw at the end of 1989 at the initiative of the Institute of Fundamental Technological Research of the Polish Academy of Sciences (still a shareholder of Sonomed). The Institute has been engaged in scientific research on ultrasonic and Doppler methods for many years. Since the establishment of Sonomed its research results have been transferred into production of the devices offered by our Company, securing their continuous modernization and high level of innovation. A Doppler dedicated to transcranial diagnostics of blood vessels was our first product. When introduced to our market, it was a unique apparatus, available only in a few leading institutions in Poland. Therefore, it was necessary to concentrate the Company’s efforts on promotion of this kind of diagnostic technique and training of the users. The device was soon supplemented with a probe for peripheral vessels, offering more complex diagnostics. The next versions of this apparatus (TDS4), produced with the use of an industrial PC platform, were equipped with a second probe, used for extracranial vessels. The equipment found buyers among private and public medical centers and was also obtained by the Ministry of Health. The MD4 pocket flow detector was a completely different product made by Sonomed – very simple and easy to use. The perfectly balanced design assumptions allowed us to keep the original form and concept until today and to apply any changes only due to progress in technology and electronics. Then we created a middle-range Doppler flow meter with a display and a thermal printer – the UD 48. This device was powered by an internal rechargeable battery. In one of the versions, in addition to its main use for the diagnosis of blood circulation disorders in the peripheral vessels, support for laparoscopic surgery was added. The next apparatus in our offer (the only one for use outside the vascular field) was a Doppler device designed for monitoring of pregnancies – a fetal heartbeat detector named FEDO. The special feature of this detector that makes it stand out among so many others available on the market is the high quality paired with the unique and functional design. 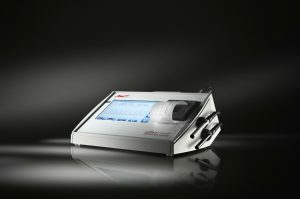 To indicate blood flow in very small vessels we developed a Doppler with a very high frequency (20 MHz) called ENDOFLOW. For many years Sonomed cooperated with the Echoson company, designing and producing Doppler modules used in its ultrasonography devices. We also provided parts of Doppler devices and ultrasonic probes for other final products. As part of one of many of our research projects, we developed a Doppler System, which integrates with a multi-parameter monitoring system used in neurosurgery. In the last years, we replaced the VENO Vascular Doppler (designed as a device that is easy to use in its basic versions but also offers a wide choice of extra options) with UD48V. The success of both products was determined by the increasing demand for screening in vascular diagnostics. Sonomed developed and implemented a quality management system based on the ISO 9000 family of standards. After more than a year of practical verification of this system, some necessary modifications were made, reflecting changes in the standard. According to the national and international standards, Sonomed introduced and maintains a quality management system that is certified by the DNV. This system, ISO 13485, ensures the quality of production, design and service of non-invasive ultrasonic diagnostic equipment. Our Company has also the right to use the CE marking for its products. Since 2017, Sonomed is also a member of the Polish Chamber of Commerce for High Technology.